Here's how the N64's video works. The video is generated by the Reality Co-Processor and clocked into the DAC through a bus 7 bits wide. This video data consists of four (7 bit) bytes synchronised with the 50Mhz Clock signal. There is another signal, I'll call it !DSYNC, which is active on the first byte of each four byte set. 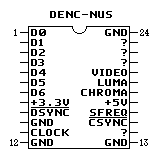 The problem with the N64 is that it's DAC doesn't output RGB (with the exception of a few early NTSC consoles with the VDP-NUS DAC), the RGB video is encoded as Composite and S-video internaly. It is for this reason that I have created an RGB video DAC: To connect in parallel with the existing DAC and fulfill this missing function that Nintendo so carelessly omitted. 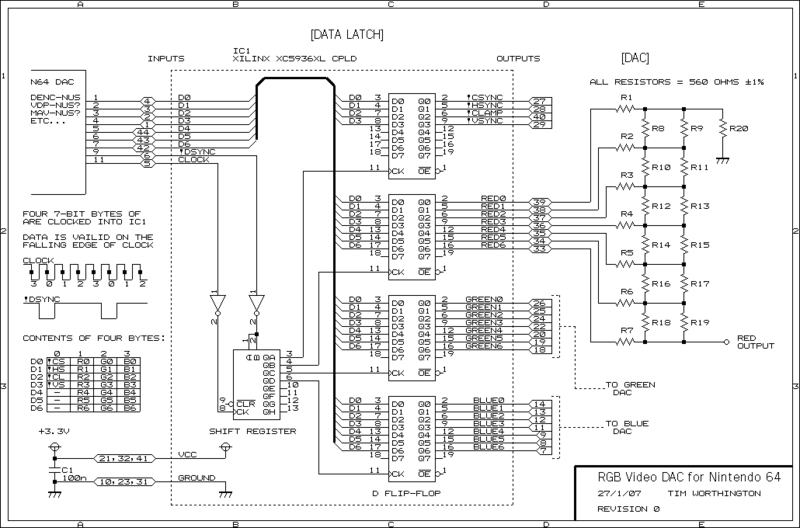 My RGB DAC is made from a CPLD (Complex Programmable Logic Device) which latches the video data and drives an R2R resistor ladder to make an analog video signal. The analog video is wired to the unused pins on the A/V port in the same configuration as the SNES. Assembly Procedure - Instructions for building and installing this device inside a N64. 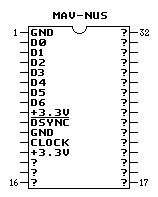 JDEC Programmer File - For the XC9536XL CPLD. 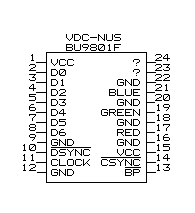 VHDL Code - This was automatically generated from a schematic capture so I'm not sure how much use it is.